For years Seoul USA has used a highly-acclaimed North Korean dialect translation of the Bible, and this is helpful in many settings (like launching by balloon into North Korea); however, many NK ministries and missionaries have struggled to bridge the cultural and linguistic gap between South Korean missionaries and North Koreans. Floyd Brobbel from Voice of the Martyrs/Canada proposed a parallel Bible: a South Korean translation of the Bible side-by-side with a North Korean translation. So this week, Seoul USA, with the support of Voice of the Martyrs in Canada, the United States, and the Czech Republic, is releasing the first ever North Korean/South Korean Parallel Bible. The unification of Korea is not primarily a political or economic or military or international event. Instead, it is an event of personal transformation where, in the words of Isaiah 58:7, Koreans from North and South repent and commit to no longer hide from our own flesh. This unification, the unification of the heart of all Korean people, has already begun. That is because God has sent more than 25,000 North Koreans to South Korea. We must each ask: Are we hiding from our own flesh? The Word of the Lord reminds us that true unification cannot be accomplished by armies or governments or NGOs or even church leaders. It can only be accomplished by ordinary Koreans from North and South regularly meeting together face to face to hear and do the Word of the Lord, by the grace of God and the power of the Holy Spirit. May Almighty God use this parallel Bible to further that purpose. Please join us in praying for the Lord to reunify a nation through this new presentation of his unchanging word. This entry was posted in Announcements, Balloon Launching, Bible, North Korea, Proclaiming The Gospel and tagged North Korea, Parallel Bible, South Korea. Bookmark the permalink. 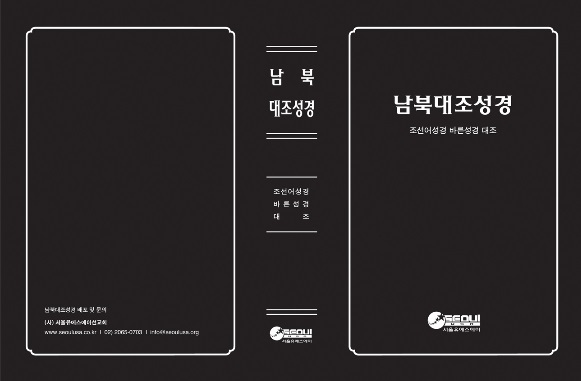 3 Responses to Seoul USA Releases The First Ever North Korean/South Korean Parallel Bible!